This 3-Day Code Academy Camp teaches the basics of programming through games and gaming platforms, web and mobile applications. Professional developers from The Biz Foundry will interact directly with students, emphasizing problem-solving as a spontaneous, fun activity. Students learn computational thinking and coding individually and as part of a team. When finished, students will host a "Demo Day," on Thursday, June 9th at 2:00 PM, showcasing their efforts as a project presentation before adults and peers. This event is made possible by NTEC - Northwest TN Entrepreneur Center in Martin, TN along with our event facilitator and sponsors. This project is funded under an agreement with Launch TN and/or the State of TN. On Monday, March 21 and Tuesday, March 22, over 100 local residents participated in a two-day workshop that has developed Weakley County’s first ever Local Food Network. Round-table facilitated discussions identified local foods and local place-making initiatives in Weakley County. The community forum on Monday at the Purple Iris in Dresden included a locally sourced dinner and dessert, presentations and interactive discussions that have started a community conversation about existing resources and opportunities around strengthening our local food system, fostering economic development, creating a Weakley County Local Food Network and promoting better public health outcomes. In collaboration with the Local Food Network Steering Committee and the Northwest Tennessee Entrepreneur Center (NTEC), the Cities of Martin and Dresden applied for the technical assistance program. Chosen from more than 300 applicants nationwide, Weakley County was selected as one of 26 counties in the nation to be a part of the Environmental Protection Agency (EPA) Local Foods, Local Places technical assistance program for 2016. This is a federal initiative to provide technical assistance to communities interested in advancing local food systems and livability goals. From the productive conversations had during the forum about how to help strengthen our local food system and local community economies, a plan of action is being developed to share with the community at large by May 2016. The forum was sponsored by NTEC, the University of Tennessee at Martin Department of Agriculture and Applied Sciences, the City of Dresden, and the City of Martin. Food and drink donations were received from the Steele Plant Company sweet potatoes, Vine & Branch Farm blueberries, Reed Angus Farm pecans, Black Oaks Gourmet Sauce, and Pepsi water. The locally sourced dinner was prepared by Chad’s Smokehouse with pulled pork from Sunnyside Farm and James P Special Recipe BBQ Sauce. A variety of pecan and blueberry desserts was prepared by Jo Ps Sweet Treats. Community members, farmers, school officials, public health professionals, business owners, non-profit representatives, city and county staff, university representatives, and other interested stakeholders are encouraged to continue their participation in the Local Food Network themed “Using Food to Build Community” Forums planned in 2016. The next Local Food Network community forum is currently being planned through the Local Food Network Steering Committee in October of 2016. Thursday afternoon, 16 middle school students attending the TN Code Academy, sponsored by Tencom, proudly presented their parents with a presentation that showcased their capabilities in computer coding. Preparing for the event, students spent three six-hour days learning the basic fundamentals of programming through gaming platforms, web and mobile applications. Through the program, students were also able to learn computational thinking and coding individually, as well as in a team. Guiding the students through the ins and outs of coding were instructors Chris Sipe and Atish Patel, both of whom are students at TTU, in Cookeville. Throughout the course of the three-day Code Academy, students were able to enjoy soda, pizza, subs, and the masterful recreation of their favorite video games through the utilization of their newly acquired knowledge in the realm of coding and computer programming. Overall, the three-day Code Camp was very well received by all of the students involved. One student stated, "It was cool! I loved it and can't wait until the summer camp." On behalf of the event Tencom owner Chris Donaldson stated, "Students spent three days learning the basic concepts of computer programming by creating video games and learning to build a basic website. The event was capped off by a 'Demo Day' event, where students got a chance to show off what they learned to their family and to members of the community. "The Dyer County Code Camp is made possible by a partnership between NTEC, The Northwest Entrepreneur Center in Martin, and Tencom Services in Dyersburg, along with our generous host TCAT-Newbern and Dyer County 4-H.
"Carol Reed, the director of NTEC, and I share a common interest in bringing informal tech learning to the people that need it most. That is, the kids in rural Northwest Tennessee. There are so many opportunities for kids in bigger cities and we both feel that with the broader adoption of broadband Internet, that there is no reason for people in rural communities to be left out of the new digital workforce. "And the kids love it. They are fully engaged, eager to learn, and respectful. They soak up the information like a sponge. It's great to see kids so excited about learning technology. "Demand has been so high that we are already planning a code camp for June. 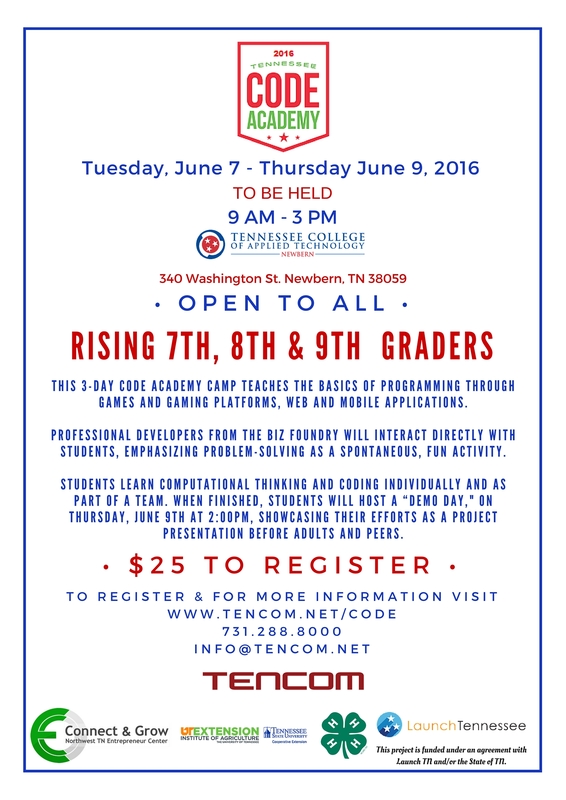 More information will follow on the summer camp at: tencom.net or on any of our social media pages." 11/21 - 100 Girls of Code - Register TODAY!